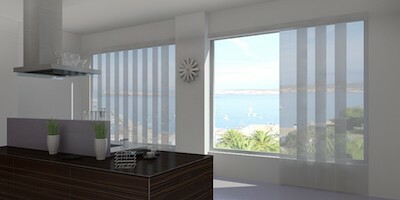 Vertical Blinds are available in a wide array of colors and textures, they are ideal for large windows, especially sliding doors or windows in factories as they allow for a section of the same blind to be completely open while another section of the same blind can simultaneously be partially open or closed at the same time. Vertical Blinds are available in a wide range of light filtering and blockout materials, standard vertical blinds are available in 2 slat widths (excluding panel vertical blinds discussed below) namely 90mm. and 127mm. 90mm. 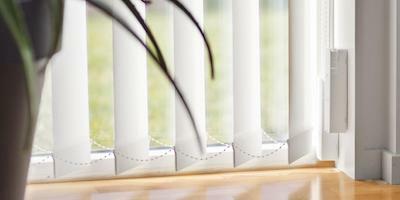 vertical blind slats are usually used in homes while 127mm. slats are usually used in industrial and commercial settings. Panel Blinds are a practical and efficient way to cover large window openings. Sliding Panel Blinds offer an elegant way to choose how much of your window to expose at any given time. Usually affixed on a sliding or stacking door, Panel Blinds are available in Sheerweave, Light Filtering, or Blockout options. 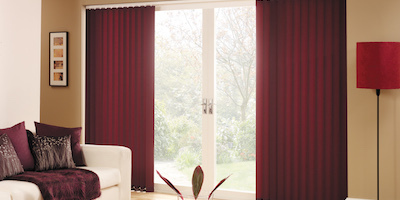 This makes Panel Blinds ideal for any room in your home.